With a Peter Pan-inspired theme of Neverworld, this weekend is all about escapism, and we drew crowds with our lively Charleston class three times over the weekend, despite battling larger sound systems nearby. Revellers were so keen they continued to follow along to our Michael Jackson Thriller Charleston routine (impressive!) and when we took to the decks to play tunes for the hour after class, the bar tent continued to hop. One of our biggest crews so far this summer, it was great to use extra Mudflappers for even more crowd engagement, and give our resident DJ centre stage for a while. Returning to the spectacular Festival number 6 in Portmeirion is always an honour, and this year we had our work cut out for us, doing dance slots between each of the live acts in the central village square. We kept the piazza pumping despite some sideways rain and wind – even extending the set by nearly an hour and pulling out some party tunes when the bands couldn’t get onsite! The crowd were amazing, dancing with their brollies and wellies – if ever the Mudflappers truly earned their moniker, this gig was it! 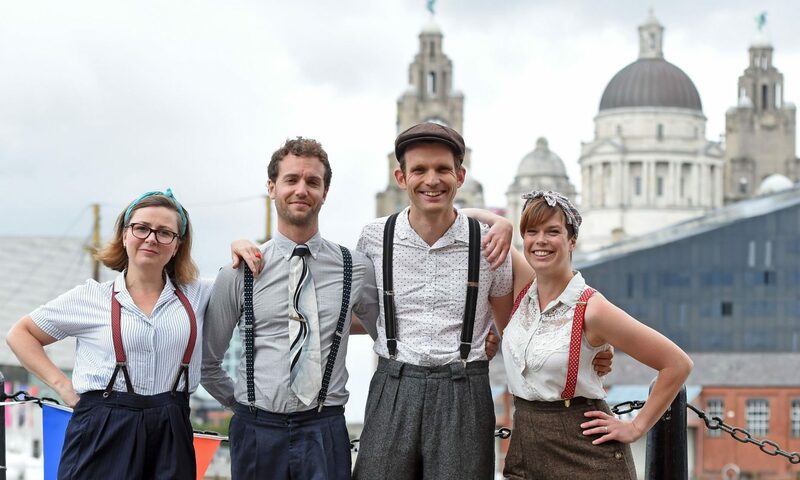 Tom, Eleanor, Oli and Jenny headed to Liverpool to teach, perform, and get people dancing (even in the pouring rain). We ended up being featured on local radio. The Idler Academy again provided a place for us at one of our favourite festivals to run our fun-loving swing dance class and performances. This year, it started as a gentle Sunday afternoon activity to close up the day’s schedule, and ended up with us being joined by some swing dance friends and throwing down moves in some jam circles, keeping the crowd going much longer than anyone expected!